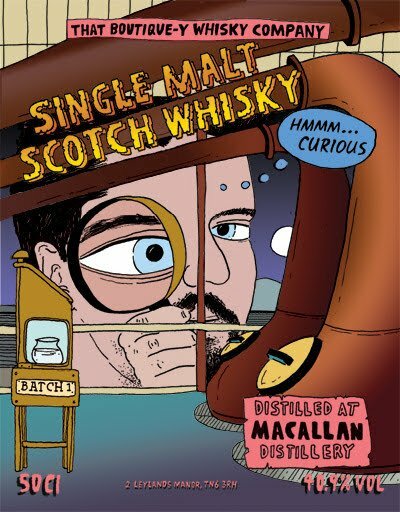 There are times when you look back and think to yourself “ I can’t believe it has been that long” and “ where did the time go “ and this is no exception.. That Boutiquey Whisky Company just turned 5 years old and it just seems like yesterday they were releasing those first bottles. 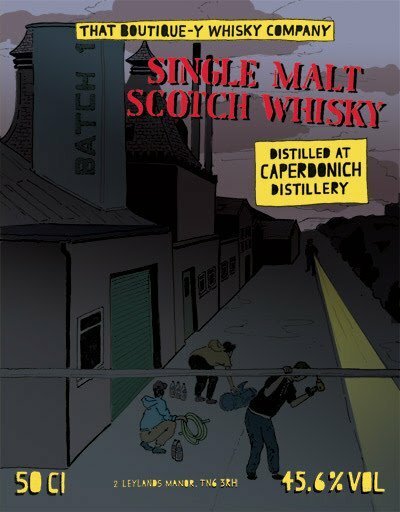 2012 was the year Boutiquey released the first bottles which included a bottle of Ardbeg, Macallan, Caperdonich, and Port Ellen with the Ardbeg boasting label #1.. So many bottles later ( 100 labels and 230 batches) and the company has a true following with it boasting its unique labels which are the work of Emily Chappell, a very talented artist and designer. 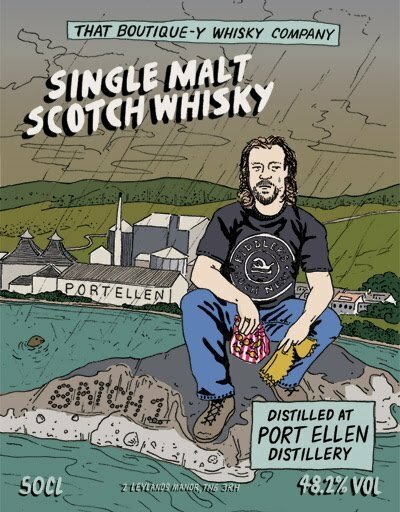 Today those very labels and cards are becoming very collectible with the whisky geeks with people trying to produce sets and even mounting them on walls and picture frames ! 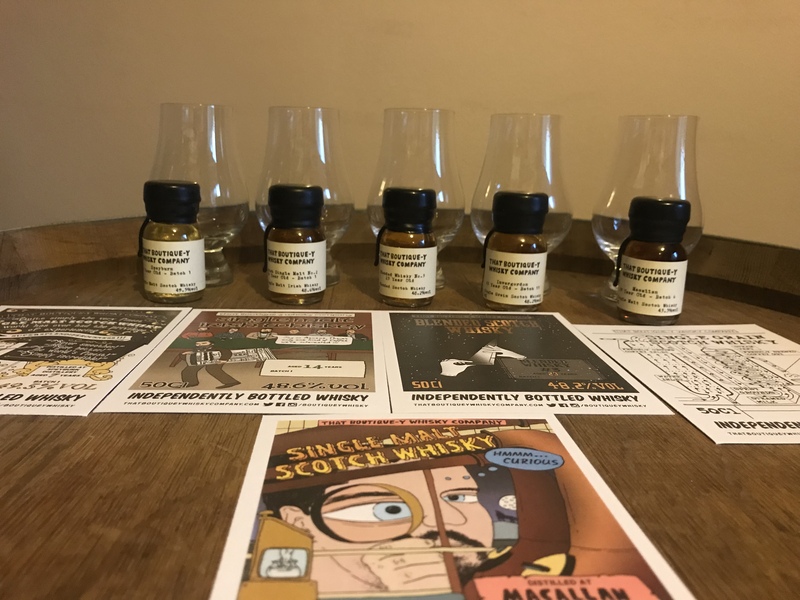 So back to the birthday bash last night (11-10-2017) Those very kind people at the Boutiquey headquarters decided to throw a birthday party with whisky and pizza (Boutiquey Dave ate all the pizza ) 20 names were selected, contacted and samples were sent out in order to do a little live tweet tasting ( if you had seen the mayhem behind the scenes you would have thought we had all gone mad) the conversation flowed and all had a fantastic night with some absolutely fantastic whisky on offer..
Speyburn 7 yo Batch 1. Irish single malt No 2, 14yo batch 1. 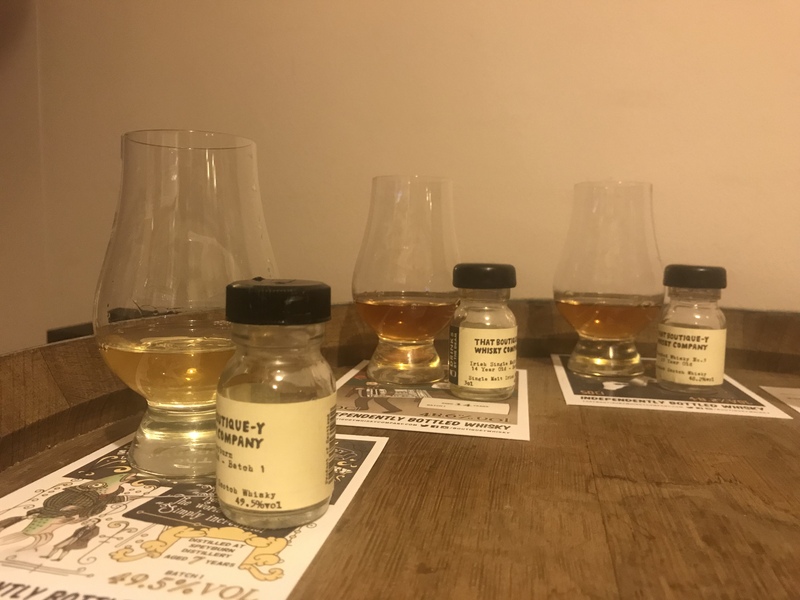 My attention was instantly grabbed by the Invergordon 43 yo grain as I’m am so loving my grains these days but let me give you my thoughts on them all..
7yo Speyburn, bottled at 49.5% abv.. 233 bottles were produced. Nose.. Fresh and floral like an early morning walk through a damp meadow.. Honey, poached pears, citrus notes and digestive biscuits. 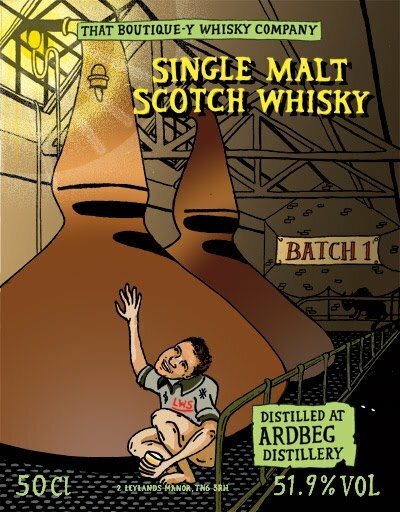 Palate.. Citrus notes, chocolate orange, honey, vanilla and toffee with a hint of ginger. Finish.. Spicy with fruity notes. 2nd on the night was..
14 yo Irish single malt, bottled at 48.6% abv with 357 bottles. Nose.. Espresso coffee, toffee apples, caramel, sugared almonds and a subtle hint of dried fruits. Palate.. Spices mingle with dark chocolate, coffee, candied orange toffee and all wrapped in a soft oak overcoat. Finish.. Soft oak and spices. 3rd dram of the night was..
23yo blended whisky no 3, bottles at 48.2% with 463 bottles produced. Nose.. Dried fruits, dark chocolate, coffee grinds, soft tobacco notes, old leather and a touch of vanilla..
Palate.. Spices, dried fruits, leather, liquorice and chocolate muffins. Candied oranges, and a little honey. 4th dram and my personal favourite on the night..
Invergordon 43yo bottled at 48.2%, 186 bottles were produced. Nose.. Butterscotch, caramel, toffee and vanilla with a hint of popcorn ( probably the butterscotch again) and candy floss.. A delicate hint of coconut and subtle oak in the background. Palate.. All the goodness from above with loads more sweetness and smiles.. Finish.. Soft spices mixed with an addictive sweetness. Last up on the night..
Macallan 29 yo batch 6, bottles at 43.5% abv and an outturn off 293 bottles. Palate.. As above but with more spices, a hint of pepper, cinnamon and ginger.. Thoughts.. When you are sent samples like these you know it’s going to be a great night ! 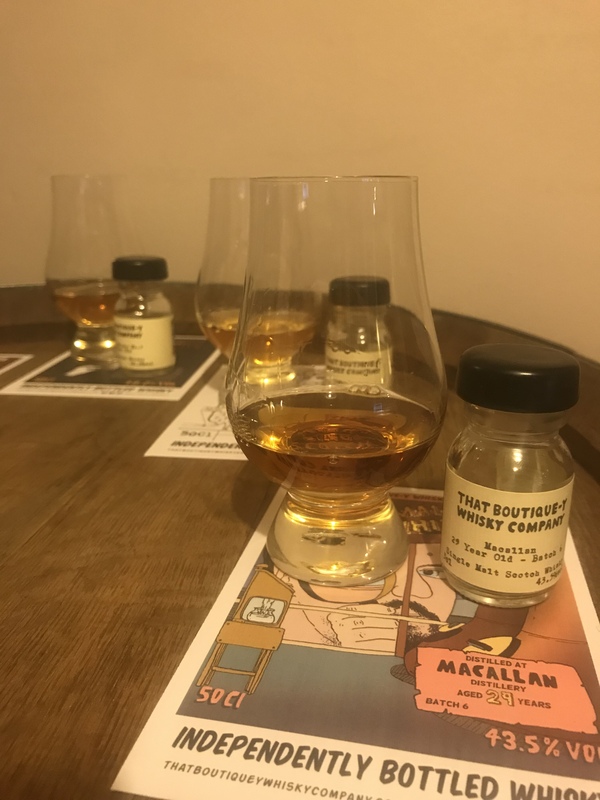 Boutiquey Just seem to be getting it spot on these days, the bottles they are producing are top notch..
Every dram tonight hit the spot with everyone and that isn’t easy these days with everyone having different tastes so well done to the team ( Boutiquey Dave) for picking a perfect line up.. 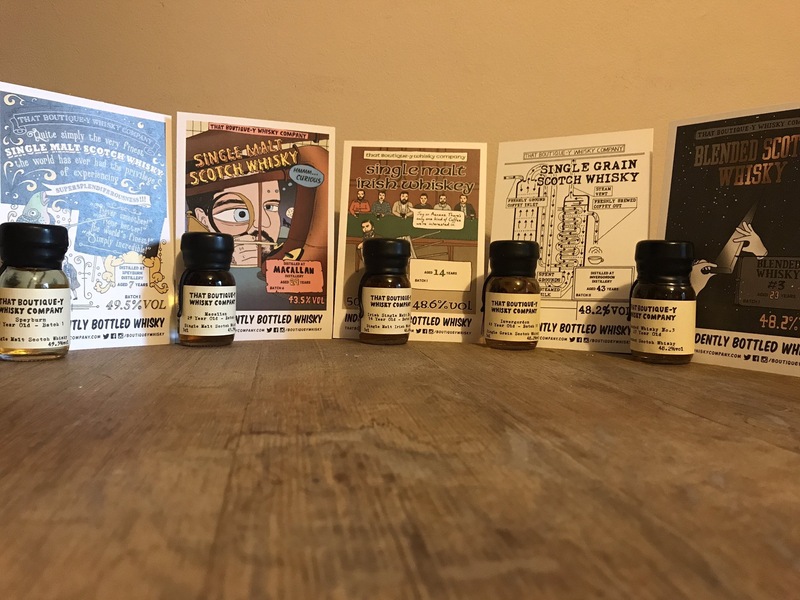 I would like to thank That Boutiquey Whisky Company and Dave for the invite and superb selection of samples.. Previous Post Douglas Laing Release The Gauldrons..
Great write up ! Makes me want to try some of these whiskies. Hello. A very nice read and well written piece, thank you for this share.